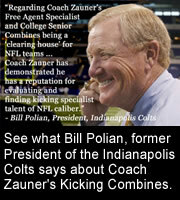 WHY ATTEND A COACH ZAUNER KICKING CAMP? 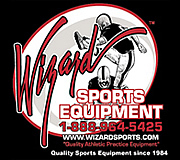 Why Attend A Kicking, Punting or Snapping Camp or Take One on One Lessons? Coach Zauner hosts January, May and July PRO Development Camps for kickers, punters and snappers in Phoenix, AZ and Milwaukee, WI. These three-day PRO Development Camps are designed for specialists to receive individual instruction in a small group environment. Drill work, video review session, evaluations and competition with excellent accommodations. Coach Zauner puts ‘Teaching and Individuality’ first while emphasizing ‘A Natural Style of Kicking and Punting’®in his ONE on ONE Lessons. Each specialist will work to refine their technique to take their game to the next level and stay on ‘A Specialist’s Path to PRO Football’®. PRO Development Camps to prepare for not only their upcoming college season, but also after graduation for the NFL Combine, the Coach Zauner College Senior Specialist's Combine and Pro Days. This includes charts (handed out in hard copy plus gone over on PowerPoint) of snappingtimes, handling times, hang times, and expected field goal percentages. The meetings make it clear what these standards are and show you how to practice properly. This includes how to film yourself, and when a camera is not available how to chart yourself properly so that you can monitor each practice. The camp also shows you how you personally stack up against other top kicking specialists. Coach Zauner is a former 13-year NFL Special Teams Coordinator for the Minnesota Vikings, Baltimore Ravens and Arizona Cardinals. Prior to my NFL career I coached in the college ranks for 11-years. In March of 2013 I had the honor of being inducted into the Wisconsin Football Coaches Association Hall of Fame. Also, I have coached kicking specialists for 40 years at the NFL, college and high school level. Throughout my coaching and consulting career I have had the privilege to work with 22 PRO Bowl and 95 NFL kicking specialists. I believe what separates myself from other kicking coaches and kicking camps around the country is my philosophy on teaching ‘A Natural Style Of Kicking & Punting’. My One on One Kicking, Punting and Snapping Lessons, PRO Development Camps, College Senior and Free Agent Specialists Combines were all designed to be ‘A Specialist’s Path To PRO Football’. And now these Arizona High School Kicking Camps are geared to be ‘A Specialist’s Path To College Football’. These High School Kicking Camps are specifically designed to help specialists refine their technique, sharpen their skills and improve their fundamentals through proper and repetitious drill work. As a teacher and kicking coach I believe in having the ability to perform at a high level. I do not believe in the Rankings and Ratings Systems used by several camps and recruiting services, as there are too many unaccountable variables. Unfortunately it is the way of the current college recruiting system. Therefore, the goal of these Arizona Kicking Camps is assisting specialists to achieve individual growth and maximize their performances. Continuous training allows the specialist to reach their full potential and therefore compete more consistently at the Competition Showcase Events around the Country. This invaluable exposure provides an opportunity to receive a scholarship offer and play college football. 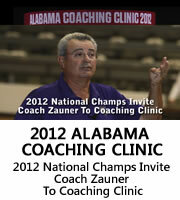 Campers are video taped, analyzed, evaluated and instructed personally by Coach Zauner and his trained coaching staff. Camps are limited to a small group environment with competition in a group setting. Currently these Arizona High School Camps are scheduled for April and December, so bring the family to sunny Phoenix Arizona where you can soak up some rays, take in the sites and experience a First Class Camp at Top Rated Facilities. Register today to attend one of Coach Zauner's High School Kicking Camps and lets work together to take your game to the next level by learning the ‘Natural Style of Kicking and Punting’. I hope to see you in the desert where you can learn to ‘Kick Like A PRO’!